Reading Cheese for sale. Buy online at Zingerman's Mail Order. Gourmet Gifts. Food Gifts. 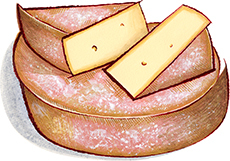 Reading (pronounced “redding”) cheese is made at Spring Brook Farm in Reading, Vermont. It’s a semi-firm, washed rind cheese. Think Swiss raclette and you’re not far off. It’s aged for four months–just enough time to let the paste (that’s the cheesemonger term for the inside of the cheese) get a bit soft and runny while the rind becomes firm. The flavor is bright, fresh sweet, creamy, with just a bit of rich nuttiness. Also like raclette, the Reading would be fantastic melted: over potatoes, on bread, in omelets, in a sandwich. It's also great on a cheese plate with pickles and mustard. The wheel we're currently cutting into was made in October 2018. It has quite a sweet flavor—it almost tasted honeyed.